As a young man, Earvin "Magic" Johnson admired his father and other small-town entrepreneurs who created jobs and served as leaders in his Midwestern community. He worked for them, watched them, and his interest in building communities through economic development grew even while his basketball career flourished. His fame as an NBA star gave him access to some of the most successful business leaders in the country. It was Earvin's own entrepreneurial spirit that inspired them to serve as his mentors. 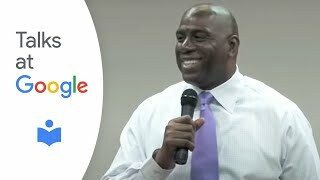 He is Chairman and CEO of Magic Johnson Enterprises (MJE), which provides high quality products and services that focus primarily on ethnically diverse and underserved urban communities through strategic alliances, investments, consulting and endorsements. 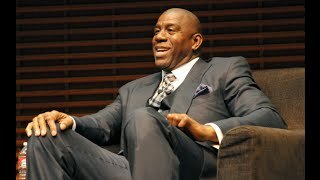 The conglomerate is comprised of multiple business entities and partnerships that include Canyon Johnson, a $1 billion dollar real estate fund, Yucaipa Johnson, a $500 million dollar private equity fund, ASPIRE, a new African-American television network, SodexoMAGIC, Magic Airport Holdings, Inner City Broadcasting Corporation, Magic Johnson Bridgescape Academies, and Vibe Holdings, LLC – Johnson is the Chairman of the multi-cultural media company that houses the Vibe, Uptown, and Soul Train brands. Johnson has also teamed up with Tim Leiweke of AEG in an effort to build a new stadium and bring an NFL team back to Los Angeles as well as thousands of jobs to the city…The story of Johnson and Larry Bird's inspiring friendship and rivalry was presented in a theater adaptation of Magic & Bird on Broadway in April 2012.